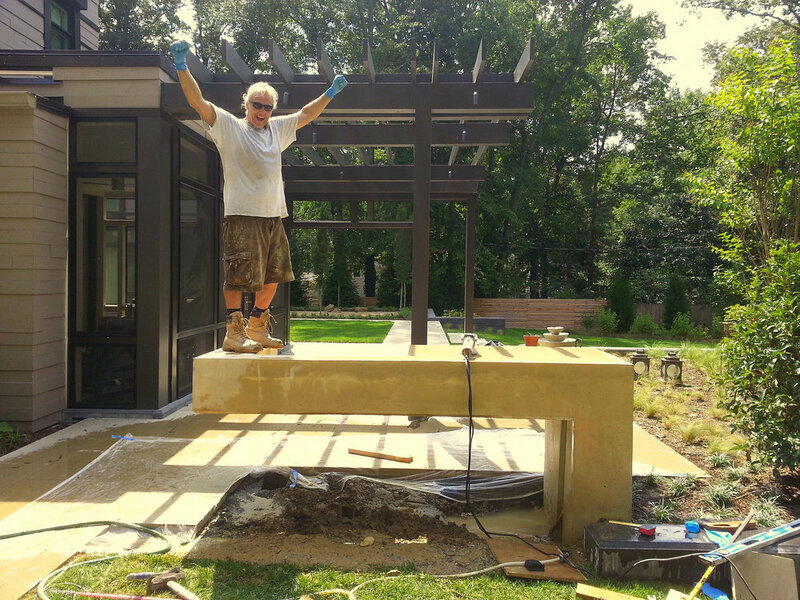 This project consisted of the forming, reinforcement, Casting in Place and finishing of a 9’ long x 3’ wide, unsupported, cantilevered outdoor grill station. The landscape architect worked closely with Hyde Concrete due to our ability to do extremely innovative and difficult work with decorative concrete. From the initial design sketches, the intention was to celebrate the strength of concrete by extending the cantilever as much as possible. Once the design concept was finalized, the next step was to get the design to a structural engineer for detailed reinforcing drawings. This project is unique because of the long, unsupported cantilevered beam that supports the grill! The owner was very concerned that the grill would break and harm her children, so I had to jump on the end to make her believe the phenomenal strength the piece has.